Outline When Maggie goes missing on a hunt, Sam, Dean, Mary, and Bobby race to find her. Arriving in Claremore, Oklahoma, late at night, Maggie begins recording her first solo hunt, which she believes is a ghoul. Upon enter the the Rawling family's crypt, she is soon attacked by a ghoulish figure hiding in the shadows. After finishing up a briefing with the Apocalypse World hunters, Sam realizes that Maggie has missed her check-in. Sam reveals to Dean that he has implemented body cams for all hunters to help others learn, as well as find out what happened if a hunt went wrong. Checking the server they see Maggie get attacked by what they think is a ghoul. Believing Maggie could still be alive due to ghouls being scavengers, they head off to Claremore. Arriving at the Rawling estate, they enter the private crypt and begin searching for clues, but are soon found by the groundskeeper, who takes them to the house to speak with the owners. After they are greeted by Neil, they tell him they are the Historical Preservation Society, which elates Neil, but prompts to ask why four people are needed, revealing that Mary and Bobby have also come to investigate. While Mary and Sam discuss the case, Dean and Bobby discover that the person they have been talking to is the full-time nurse of the owner Patrick Rawling. Neil introduces them to Mr. Rawling, who is both identical to the ghoul in Maggie’s video, and in a coma on life support. Sasha Rawling, Mr. Rawlings' daughter, arrives. She is confused as to why there are people in the house, and asks them to leave as she can't cope with their questions on top of her father’s failing health. Once outside, Bobby snaps at Sam, blaming him for Maggie’s predicament and, although Dean and Mary jump to Sam’s defense, it’s obvious that Bobby’s words just confirm what Sam is already thinking. Mary takes the opportunity to split them up by searching with Sam while Dean and Bobby work together. After separating, Mary uses the time to praise Sam on his leadership and they discuss her possible relationship with Bobby, but their conversation comes to an abrupt end when they discover the remains of a burnt wallet full of fake identification cards that seems to belong to a hunter. Meanwhile, Dean and Bobby find an old shed. As Dean enters the shed, Bobby is distracted by a man walking in the woods and goes to investigate. After Dean finds the body of the hunter who owned the wallet Sam and Mary found, he turns around to get Bobby’s opinion and discovers he is alone except for the ghoul that attacked Maggie. Acting on instinct, Dean stabs the ghoul as it rushes him, only for it to explode into a cloud of thick dust. Back at the house, Sasha hears what she presumes is rats in the attic and gets surprised by a vampire which, when she flees, doesn’t chase her. When Dean returns to the house to explain to Sam what he has found, he discovers Mary and Sam explaining that monsters are real to Sasha and Neil. They all agree that the vampire's behavior was strange and that it seemed less intent on killing her than on stopping her reaching the source of the noise in the attic. As Mary goes to check on Bobby outside, Sam decides to check the attic while Dean stays with Sasha and Neil. Outside, Bobby is attacked by something in the form of his son Daniel, with burned out eyes. As Daniel pins Bobby to a tree with an angel blade and tells him how the angels killed him slowly by crucifying him piece by piece, he is interrupted from delivering a killing blow by Mary, who shoots at Daniel to no effect. Daniel overpowers Mary and begins choking her on the ground until Bobby manages to pull the angel blade from his shoulder, freeing himself, and stabs his son with it. Daniel, like the ghoul, explodes into thick grey dust. In the house, Sam is cautiously heading towards the attic, determined to see what the vampire was hiding. Much to his relief, he finds a weak but very much alive Maggie, whom he attempts free as she tries to warn him, Sam removes the needle from Maggie’s neck, and begins to pick the locks on her cuffs, all the while telling her not to apologies for being captured. The vampire attacks and, like Dean, Sam stabs the creature and it, too, explodes into dust. Downstairs, Dean finally recognizes the way Patrick is attached to blood bags from when he was held captive by a djinn and realizes that Neil is the one behind everything. He sends Sasha to make him a sandwich, insinuating to her to just leave the room to keep her safe, which Sasha realizes and does. When Dean pulls his gun on Neil and tells him he knows he is a djinn. Neil confesses confusion at Dean’s anger because they had met previously when Dean was possessed by Michael and he’d assumed that this was the archangel testing him. As Neil slowly approaches Dean, ignoring his warnings, Dean shoots him in the knee, which causes Neil to instantly jump on Dean. Neil tells Dean he wouldn't hurt Michael's favorite "monkey suit", but is curious to know what Dean's nightmares are and tries to use his power on Dean. However, Neil recoils in horror at what he sees in Dean's mind, allowing Dean to retaliate by bashing Neil's head with a bookend. 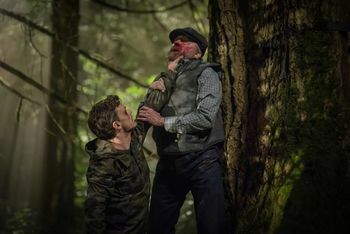 On the ground and bloody, Neil taunts Dean with the knowledge that there are dozens of hunter traps set up everywhere by Michael and that Dean and his family are as good as dead. Dean viciously bashes Neil to death, unloading his gun into Neil's corpse for good measure. After removing the needles from Rawling, Dean assures Sasha that he will be fine and will come to soon. he leaves Sasha with her father, who momentarily wakes up. Back at the Bunker, as Maggie is reunited with the other hunters, Mary hears Bobby’s confession and tries to ease his guilt over his dead son. They decide to rest up at Donna’s cabin for a few weeks and work on their growing relationship. As they say their goodbyes, Bobby takes the chance to apologize to Sam and praise his leadership. Sam and Dean call all the hunters they know to warn them about Michael’s traps and new and improved monster army, telling them to use the buddy system. Sam attempts to ease Dean’s guilt for Michael’s actions, explaining that Dean allowed himself to be possessed in order to save his family and that together, as a family, they will beat Michael. Dean: Something on your mind, Bobby? Bobby: Yeah. Your brother. He let Maggie come here when she had no idea what she was walking into. She wasn't ready. Dean: Oh, c'mon, when is anybody ever ready? Bobby: You are or you ain't. A real leader would've seen that a mile away. Mary: Sam. Watching you these last few weeks, you know what I've been saying to myself? 'This is what he was born to do.' If Bobby can't see that, then it's not the only thing he's been missing lately. Sam: Well, I'm, uh... still getting to know this Bobby. Um, our Bobby wasn't the most open person either. Not at first. His wife, she, uh -- she was possessed by a demon, and he had to take care of it himself. Mary: They never had any children? Sam: No. Anyway, point is, people put up walls for a reason. So, whatever your Bobby has behind his... doubt it's pretty. Mary: But you think I should try and find out? Sam: You know what? If you care about him, I think you should. Dean: Oh, good. You told them. Dean: Can I give you a little advice? Let it go. The past is... There's nothing you can do about it now, so it's just baggage. Let it go. You'll feel a lot lighter. Sasha: Is that what you do? Dean: I try. Every single day. Daniel: What? Here? Real? But here I am. And, damn, this feels real good. C'mon, Dad. I know you're curious -- what they did, what you let them do. It's kind of a funny story. They crucified me, piece by piece. Neil: Hmm... I thought when you showed up with that ridiculous 'Historic Society' story that you -- he was testing me, making sure I kept up my end of the bargain. Neil: Find somewhere quiet, set up shop, kill as many hunters as I can. Neil: It's what he does. Djinn -- What powers do we really have? Trapping our little flies, weaving our poisonous webs inside people's minds. It's all so... limiting. Now, one touch -- I read minds, see nightmares. And because of him, because of you, I can bring those nightmares into the world -- make them do whatever I want. Neil: Rawling? His worst nightmare is dying in this house -- unmourned, unloved, rotting away in the family crypt, alone with his own regret. It's a tad macabre, don't you think? Now, your little hunter girl? Hers were much more interesting. It's a shame what those vampires did to her family. Quite a place she comes from, and your friend Bobby. The things slithering around in his mind. Ooh. Bobby: Daniel was my son. My wife, God rest her she didn't die natural. Daniel and I buried her together. After well, hunting, that -- that's what got us through. Then the angel war started. I'd been called up to serve before, so they gave me a platoon, I guess you could call it. Dan was in it. We got separated. I guess you can figure where this is headed. Mary: It wasn't your fault. Bobby: I'm the one that brought him to war. I'm the one who sent him to die. I don't even know what they did to him. The angels took them. We never found the bodies. I never figured I'd be any kind of a father to a child. But Daniel was the best thing in my life. I always assumed that war'd kill me, too, but it didn't. I guess lately, I've been looking for other options. Bobby: It ends the same. Mary: No. You are not allowed to give up on me. Bobby: I don't know any other way to live. Mary: Then we'll find one. Dean: I know, I know. Not my fault. It's Michael. It's all Michael. You know, I've been trying to -- not forget, but to move on from what I -- from what we -- from what he did. And I got to be honest, I was starting to feel like myself again. Almost. Sam: So we'll work harder. Dean: How, Sam? You get three hours of sleep a night. Sam: All right, then I'll sleep two. Dean, we're going to find Michael, and when we do, we will kill him. Sam: I don't know. We'll -- We'll -- We'll track down Dark Kaia and her spear. We'll -- We'll find something. Dean: I hope you're right. Dean: But what are we talking here? Are they some sort of weirdo shut-ins like the Addams Family? The Addams Family is a fictional family originally portrayed in cartoons and later a TV series and movie. They lived in a Gothic mansion and delighted in the creepy and macabre -- the opposite of the clean-cut wholesome American 1950's family ideal. Dean: I know what a walker is, Sam. This is a reference to the popular show The Walking Dead, which currently stars Jeffrey Dean Morgan as Negan. Jeffrey Dean Morgan also portrayed John Winchester on the first two seasons of Supernatural. Additionally, the character of Maggie Rhee was portrayed by Lauren Cohan who played Bela Talbot in season three of Supernatural. Several other actors who have appeared on Supernatural have played various roles on The Walking Dead as well. In the comics and TV series, zombies are referred to as "walkers." Sam uses the aliases Harrison and Byrne for himself and Dean. Jerry Harrison and David Byrne were the keyboardist/guitarist and lead singer, respectively, for the Talking Heads. Bobby: You think I was too hard on your brother back there. Dean: He's doing his best. He's doing better than his best. You know, this whole Hunter Five-O thing -- he's -- he's killing himself over it. He doesn't eat, he doesn't sleep, grew himself one of those Kenny Rogers beards. No offense. Kenny Rogers is a country singer who has always worn a beard. Sasha: Well, my father's dying, and there's a strange man sharpening a.. machete to presumably kill monsters with in my living room. Thank God for benzos. I never should have come back here. Thanks, Dad. Benzos is short for Benzodiazepines, a class of drugs with a sedative effect, often used for the treatment of anxiety. The deaths of the Nightmare Creatures, where they explode into dust, is similar to the death of vampires in most popular culture, particularly Buffy the Vampire Slayer and Buffy's spin-off series Angel. Leah Cairns, who played Sasha Rawling, previously played Julie Hudson in 2.08 Crossroad Blues. Sam has equipped all the Apocalypse World hunters with personal video devices which upload directly to a server. This way they can both monitor each other's activities and use the footage for training purposes. Sam calls these devices body cameras, which are now in frequent use by police departments across the US. At Rufus's funeral in 6.16 ...And Then There Were None, Bobby told Sam and Dean that when Karen Singer was possessed, it was Rufus who exorcized the demon, cleaned up everything to prevent Bobby from going to jail for killing her, and introduced him to the supernatural. Bobby revealed in 7.10 Death's Door that he was so afraid of turning out like his drunk abusive father, Ed Singer, he never had kids of his own. Sam: Remember, uh, the -- the guy in the old folks' home? He could -- He could make things go "Looney Tunes." Dean: Fred Jones -- Yeah, Dad's buddy. This is a reference to 8.08 Hunteri Heroici where the Winchesters and Castiel investigated a case involving a psychic named Fred Jones whose powers warped reality around him to resemble a cartoon. Dean: It didn't hit me at first, but then I remembered -- I've seen that rig before, long time ago, when I was hooked up to it. You're not giving him blood. You're taking it. You're a djinn. This is a reference to 2.20 What Is and What Should Never Be when Dean was captured by a djinn, put into the Wish-verse, and partially drained of his blood using a similar rig to Neil's. It was also the first time the Winchesters ever faced a djinn. Sam organizes for Mary and Bobby to spend some time at Sheriff Donna Hanscum's cabin, which is a "half day's drive" from the Bunker, in Lebanon, Kansas. The key to the cabin in under a garden gnome. As Sam and Dean warn other hunters about Michael's Monsters, Dean can be heard talking to Garth. This page was last edited on 28 February 2019, at 06:05.